Submissions are starting to come in! Remember, the photo with the most likes wins the contest – like the photos individually to cast your vote. Then go out and make something to submit yourself! You can build a snowman, snow sculpture, or any other snow “creation” right at your own home. Just snap a picture of your creation and submit it to our Facebook page via Private Message. We will post submissions to our page, and the way to win is simple: the photo with the most likes wins! 1. The contest will run from December 15 through January 31. All submissions must be received no later than midnight on January 31, and voting will take place through Moosestompers Weekend (February 1-3, 2019). 2. The contest is open to Maine residents within 45 miles of Houlton. 3. 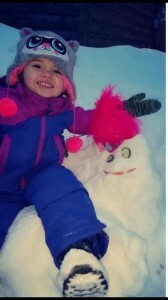 Private message the picture of your snow creation to our Moosestompers Facebook page. 4. Entries are to include the photo, the entrant’s name, address, and email address. 5. Entrants must “like” the Moosestompers Facebook page. 6. All entries are subject to approval by Moosestompers Page Administration. Moosestompers maintains control over all postings. 7. Contestants are encouraged to take high-quality photos. Suggested quality is 300 dpi or higher. 8. The photo must be original and cannot be submitted of other people without their permission. 9. Winner(s) must be willing to submit or have a photo taken for our Facebook page, newspapers, or other marketing media. 10. Moosestompers maintains the right to publish and/or use all photos submitted into the contest in our marketing and advertising. 11. Moosestompers maintains the right to publish the photo, name, and hometown of the entrant. 12. Entrants or participants must comply with Facebook rules by acknowledging that the promotion is in no way sponsored, endorsed, administered by, or associated with Facebook. The entry with the most “likes” wins! Winner(s) will be contacted by email. For inquiries, please contact us through a private message on our Facebook page.